The following obituary was in the January 24, 1940 Hinton Daily News. Paper has name spelled Irvin. 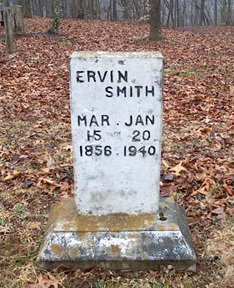 Irvin Smith, of Meadow Creek died at his home, Monday morning, January 22, 1940, after several months illness, aged 83 years. His death was due to age infirmities. He was a native of Abraham, Raleigh county, and had resided in the community of Meadow Creek most of his life. Mr. Smith was a merchant there for a number of years. He is survived by one son, Walter M. Smith, of Meadow Creek. Funeral services will be conducted today (Wednesday) at 2:30 o'clock p.m., in the Meadow Creek Baptist Church, Rev. L.H. Martin officiating. The burial will be in the Meadow Creek cemetery.